The industry-leading manufacturer of high performance mobile electronics and the only manufacturer specializing in mobile multimedia incorporating digital products for your mobile entertainment. Kenwood delivers quality audio products with cutting-edge technologies and continues to blaze trails with products that work seamlessly and sound great. These state-of-the-art systems give you the peace of mind in knowing that your car is being protected and you won't have to suffer through the heat or the cold as your car gets going. Viper prepares the temperature of your vehicle in advance before you get in. Protect your vehicle and its contents with the very latest technologies in security and convenience. Add the convenience of keyless entry to virtually any vehicle, even those without power door locks! CALIBRE Radar & Laser Protection Systems incorporate breakthrough wireless technology. With its own independent wireless network, CALIBRE not only protects you from speeding tickets, it protects your car’s complex electronic system and your car warranty. The BELTRONICS™ Professional Series GX65 is the most sophisticated radar and laser detector in the world. The GX65 delivers the best long-range warning on all radar bands. The BELTRONICS Pro GX65's GPS powered technology provides permanent relief from false alarms including automatic door openers, motion sensors and other radar-based sensors. Avital has been one of the biggest names in vehicle security and remote start for nearly 20 years. Wherever cars are stolen, where winter roars and rages, consumers look to the security and convenience of Avital! The NAV-TV CAM11 Rear View Camera is ideal for use with the NAV-TV line of video interfaces. The camera is mounted to a black plastic frame that features two holes spaced apart for mounting on your vehicle's license plate frame. The NAV-TV CAM12 Rear View Camera is ideal for use with the NAV-TV line of video interfaces. The camera is mounted to a black plastic frame that features two mounting holes. The NAV-TV CAM13 Rear View Camera is ideal for use with the NAV-TV line of video interfaces. The camera is designed to be flush mounted on the vehicle, usually in the bumper, but other loctions can be used. The NAV-TV CAM14 Rear View Camera is a complete license plate frame / camera solution. The standard license plate frame is made of black plastic and features infra red night vision sensors all around it for optimal image viewing in low light conditions. The Precision Park 4000 is a reverse park assist system utilizing ultrasonic technology to detect obstacles behind the vehicle when backing. The system engages when the vehicle is in reverse. A leader in mobile solutions for more than 40 years and offering 130 degree adjustable wide angle back up cameras compatible with most monitor/TFT screens. High-performance home audio products staying one step ahead of the pack, driven to create components that consistently raise the world's expectations for stereo performance. Headrests Monitors with built in DVD players, standard and multiple A/V source capability, give users the ability to switch between the driver and passenger side DVD player or an auxiliary input. A global leader in wireless devices for mobile phones, Parrot has developed the most extensive range of hands-free systems including wireless multimedia products geared towards audiovisual applications. The Pacific Accessory Corporation - better known as PAC - has been a major player in the OEM integration business since the 1970's, back when the 8-track player was the iPod® of the day and replacing a radio involved hours of cutting and splicing. Their goal is simple: to provide distributors, dealers and installers with the latest products, solutions, support and training necessary to satisfy the needs of their customers. 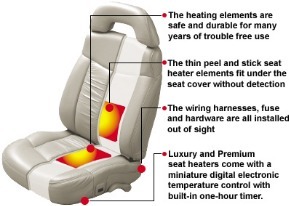 Seat heaters from the Check Corporation quickly provide comforting warmth to the body through the seat’s cushion and back long before the vehicle’s heater has a chance to heat the interior. Check Corporation has been the pioneer and leader in flexible heating element applications to these industries since it began operations, and continues to remain on the cutting edge of flexible heating element technology.